Assignment five is about analyzing three different shellcodes, created with msfpayload for Linux/x86. I choosed the linux/x86/exec shellcode as first example. I will now comment the relevant lines of the shellcode. Set edx to zero and push it in the stack for termination. This pushes “-c” on the stack. Move the stackpointer to EDI. So EDI is pointing to “-c”. Push /bin/sh to the stack and move the stackpointer to EBX. EBX is pointing to “/bin/sh”. This one jumps to 0x20. 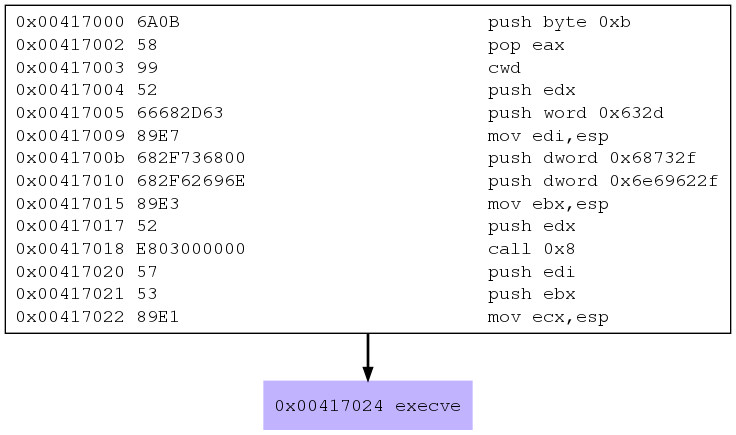 EDI (-c), EBX (/bin/sh) and are pushed on the stack, ECX is moved to ESP and the function is called. Now here comes the interesting part. It is not possible to get the command “ls” from debugging with gdb nor analyzing it with libemu. But the ls (as hex: 6c 73) command is in the code. I think that the ls is pushed on the stack too, although the debugger does not notice anything of that… hmpf. So maybe libemu can help us here. The ls command should be executed. The output is showing exactly how the execve call is build. Here it can be seen, that the “ls” command is on the stack too. From the Exec.dot file a diagram can be made for illustrating the programm execution. That was it for the first shellcode. And here is the output from the libemu analysis. I analyze the relevant parts of the shellcode, I will use both, the disassembly and the libemu output for further explanation. To shorten things a little, this part calls the bind function (which is EAX syscall 102 and EBX 1 = SYS_SOCKET = socket() ). This correspondence with the libemu output (the whole output can be seen below). 5c11 is port 4444 btw. Here EAX = ffffff66 and EBX = 4, this is defining the listen() function. EAX = 3f = 63, this is the syscall for dup2. This procedure is repeated until ECX=0, so we have any descriptor included. Finally we have the execve call. This works pretty much as in the analysis of the linux/x86/exec shellcode. I also used the debugger for analyzing the shellcode, but I think the output there is no more help. So that was it for the second analysis. Libemu and sctest did not work for me. So I will only look at the disassembly and debugging. First things first: The shellcode is using the JMP-CALL-POP technique. This can be seen very good by stepping throught the code but also by having a look at the disassembled code. Call 0x2. Be aware 3D – 48 is a data section. Here is nothing else as the path: /etc/passwd. Move 5 to EAX for syscall 5, which is open(). Point EBX to /etc/passwd, and execute. Return the file descriptor to EAX, for example 3. Here the syscall for read() is executed. For this, EAX and EBX are set to 3. EBX contains the file descriptor, ECX points EDI. EDX which presents the size is set to 1000. So finally the result is written (syscall 4 is write()) to the standart output. So that was it for the last analysis.